I LOVE the plank! It is a great way to work the core, getting your upper and lower abdominals, your lower back, and your glutes. If you've mastered the basic plank position here are some ways to step it up, and challenge yourself a little more. I'd first try to get to the point where you can hold your plank for 1:00 to 1:30 seconds. Once you've accomplished that add a small plate to the small of your back (5-10 lbs) to make those abs work harder to keep that body in line. Really watch your form as you start to get tired. Squeeze your glutes and use your lower abs to keep your body in line. You can also try lifting one foot off the ground and holding, or alternate lifting one foot of the ground at a time. The same can be done with your arms. Punching one arm at a time forward or just holding. Once you've mastered that there are a lot of variations that you can try. Press yourself up to a straight arm plank, and hold there. You'll feel this a little more in your shoulders, but its still giving that core a great workout. This position can also be done with some weight on your back. 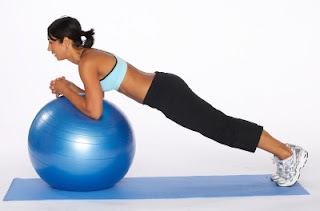 Try the plank on the physioball. In this variation you want to make sure you keep your hips down. The tendancy is to press them up to release the pressure in your back. Side planks are a great way to work those obliques. You don't have to hold a weight to do this one. Once you've mastered this exercise you can add some variations here as well. Try dipping your hips down to the ground and pressing them back up to starting position. Aim to do 15-20 reps on each side. You can also start from beginning position and curl that top arm around underneath your body so your hips rotate toward your front foot, and then back to startining. By 15-20 of those on each side you should feel it! The Plank is a GREAT way to finish off a workout. Try to do 3 - 5 sets, and you'll be amazed at how quickly you'll improve your plank, and how strong your abs will get. Keep pushing yourself and making it harder. Fight complacency!! I LOVE -(hate) the plank! But I am getting better at it! Hey Megan, Dave and I are trying to debate between an eliptical machine and a tread mill. We are stuck as far as which is better and I was wondering what your opinion is on it?